LISTEN NOW! Greg, John, and Pat discuss how God is JUST. Some have asked how could God allowed this to happen. How is that justice? God allows things to happen when we don’t make the right decisions when we are free to make them. Greg continues to share how he feels that there is going to be a convergence of Justice that is coming . You can’t repel justice. God will make sure justice is served because He is justice. Many who are afraid of justice are so because they don’t understand the Justice that God made available through the death of His son. This is a justice movement that was started long ago. We must take a look at our history and not turn a blind eye as to what has happened throughout the short time of America’s existence. They continue to discuss the coming judgments less the church repents. What you didn’t choose to do God will force you to do, because you wouldn’t get it right at the cross He will balance the scales. Things can turn and they will turn if we choose to turn to God. Greg, John, and Pat discuss the phrase President Obama said when he said you didn’t build that. Many at that time were offended by that statement because they automatically took that statement to see how it affected them but not the greater context of the history of this country. The encourage us to think deeper. In this second part they discuss statements like “we built the church” “look at what my hands have done”. God says “you didn’t build that”. They continued to discuss how many things have been birthed in pain. The church has been critizing the world but they are doing the same thing, taking credit for what they did not do. The kingdom of God doesn’t expand when we build a new building it expands when people accept Jesus into their hearts. Psalm 127:1 says “Unless the LORD builds the house, the builders labor in vain. Unless the LORD watches over the city, the guards stand watch in vain.” Church you didn’t build that… God did. America you didn’t build this nation, God allowed it to exist and He cancertainly can cause it to be removed. They further discussed the role Dr. Martin Luther king Jr. played in holding the country accountable to what was written on the paper, the Constitution. There have been huge injustices perpetrated in the land it and it requires repentance before God. It’s truly time to be One Nation Under God. Really? Don’t Run to Government GO to God. 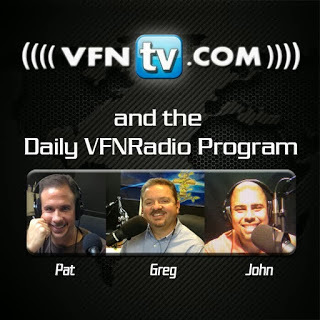 Greg, John, and Pat encourage us not to run to government but instead to run to God. They discuss how what is happening today in the government is much of what children have done when they try to deflect attention away from them when they have been caught doing something wrong. Everyone knows what they are trying to do. They discuss recent revelations from HHS Health and Human Service Secretary Kathleen Sebelius as she testifies before congress informing them that millions of Americans personal data could be compromised by felons. More specifically no background checks have been performed. They continue to underscore the importance for us to go to God instead of running to the government. The road to hell are paved with good intentions. The road to the concentration camps were paved with perceived intentions. What matters are not intentions but REALITY.